SEO is an acronym for Search Engine Optimization (SEO). It refers to a set of best practices you should perform on your website to ensure that the content on your website is discoverable by search engines such as Google, Bing, and Yahoo. SEO covers all kinds of content on your website including written content, audio, video, and images. Written content is the most obvious searchable content on your website, however other visual and audio media should be included in your SEO tactics as they now represent important content that should be included on a website. As the internet has grown in complexity, readers have been able to search for content based on their preferred method of absorbing content – written, visual, auditory. The primary goal of SEO is to ensure your website can be found online. SEO is also an important part of your overall marketing strategy. If you have good searchable and readable content on your website, then your website is considered a useful tool for potential readers. The more your website is considered as useful, the more search engines like Google will allocate you with better rankings. Think about when you search for a term on the internet. You may enter the search term ‘art therapy anxiety’ into Google and not give too much thought into why and how Google presents you with the options it does. Most people who conduct searches online usually only look at the first page of results after entering their search term. From this perspective, it’s an ideal situation to have your website presented in the results on the first page for search terms that are relevant to your therapy practice and services. Your website will appear in search results if the search terms that potential readers use exist within the content on your website. If a potential reader is searching online for “how to reduce anxiety” then your website will match that search if you also include that term “how to reduce anxiety” on your website. It’s great if you have a blog post that exactly matches that term, however, your blog title may be “How to reduce anxiety with art therapy”. Even though your title included extra words “…with art therapy”, it still included the most important search term – “how to reduce anxiety”. You may wonder how you ensure that your blog post titles use search terms that potential readers are using? To solve this problem, it’s important that you are aware of what your clients are looking for when they search online. As an art therapist you possess a wealth of knowledge on art therapy and psychological terms, however, it’s important that you write with language on your blog that your client can relate to. This requires a balance of using terminology and language that references your specialties but also uses language that reflects what a typical client of yours might use. It’s helpful to use a variety of techniques when using SEO as a marketing strategy. This includes understanding what stage of the process your client is with their search. The first stage entails the potential client recognising they have a problem that they are looking to solve. This may be dealing with anxiety, depression, grief, or specific life events. Usually, at this stage, a potential client will be looking for solutions online and may not be completely ready to book a therapy appointment. In this situation, it’s important that you include content on your website that will attract the attention of potential clients who just want to learn about solving their problem before making a commitment to an appointment. Therefore it’s important that you don’t only include content on your website that focuses solely on booking appointments. At this stage of the process, your potential client may have educated themselves on their problem and the possible solutions that exist. They may now be considering whether therapy can help them and what therapy entails. From this perspective, your website should include content that addresses your potential clients fears, worries, and concerns about attending therapy. You may want to detail how you run a session and any common fears you know your client may have that you have helped other clients address as part of an art therapy session. At this final stage of the search process, your potential client is looking to book a therapy session in their area. To help improve your website appearing in their search results you should include terms on your website that will resemble the type of searches they might use to find someone in their location. Given the complexity of SEO, a number of tools have been created by developers that help you undertake effective SEO strategies, however, you are not expected to be a computer programmer to achieve them. These tools will help you focus on ensuring your SEO strategy meets the requirements of popular search engines such as Google. The more your website impresses Google search, this means your website will appear higher in the ranking of searches made by potential readers. Search engines such as Google use automated robots and algorithms to assess your website useability and content relevance. The below tools are designed to function with the algorithms that are used by search engines. 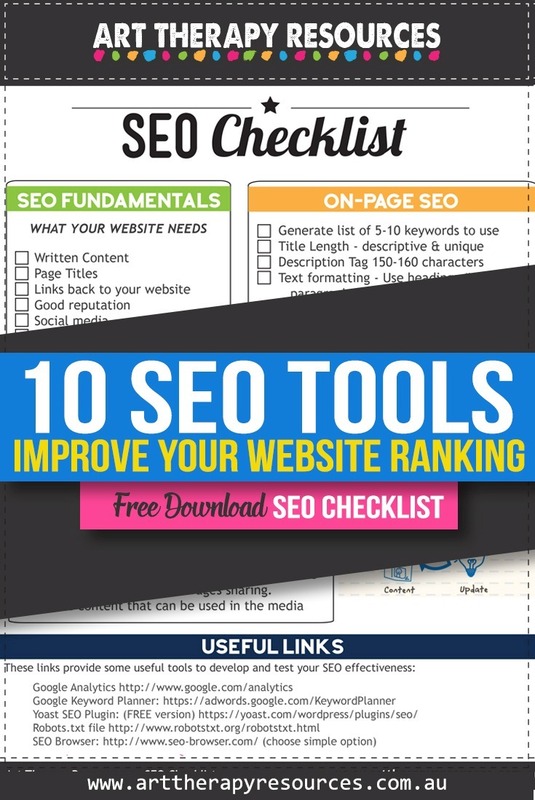 The SEO tools selected below are free to use. There are a number of paid SEO Tools that are considered useful, however, we’ve chosen to focus on free SEO tools only. 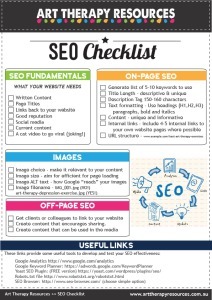 SIGN UP below to download the FREE SEO Checklist.